Vacuum sealed food items were always those interesting packages in the supermarket that appeared to be of slightly better quality than everything else. They were also not really the items you could ever imagine packaging yourself. But times and technology change. With vacuum sealers you can now mimic that supermarket quality packaging in your own kitchen. The advantages to this kind of packaging system are vast. So much you can do with it, and one of the best things: It’s fun. We took some time to break down the nature of these devices and explore why every home can actually benefit from them. Will this be the gift you order yourself for your birthday in 2019? To put it simply, a vacuum sealer uses heat and suction technology to pull the air out of a plastic bag. Once the air is out, the heating technology kicks in and seals off the open edge of the bag so the pack is held tightly shut. This all happens in a small lap-sized machine that blends in with your décor, just like any other kitchen appliance. Vacuum sealers are gaining popularity because they give users the opportunity to keep food for longer periods of time. Vacuum sealed food is less able to rot or grow bacteria because there’s no air inside. They are also incredible space saving devices, that eliminate the need for bulky, excessive packaging to keep food stored in the fridge or pantry. If the ability to save and preserve food isn’t enough, there are various other reasons why a vacuum sealer should become an addition to your home. Sous Vied cooking is a growing trend due to its very healthy nature. In order to properly sous vie food, the raw items have to first be vacuum sealed in a plastic bag and then dropped into the cooker. This is the only way to make use of a sous vie and therefore the sealer is a must. This is such a nifty perk to owning a vacuum sealer. The ability to reseal already opened packages comes in handy more often than you may think. Gone are the days of having to munch on stale chips because you couldn’t finish them in one sitting. A vacuum sealer gives you the ability to reseal chips, sweets and any other snacks that need to be kept fresh in their original packaging. The machine does this with its heating pad that simply melts the original package opening back together; no suction needed. Don’t limit the use of these devices solely to food stuffs. You’ll rest easy knowing your valuable paperwork isn’t at risk of getting destroyed even if the rest of the premises is. Want to know if this is truly worth the expense? Let’s get to the top benefits of investing in a quality vacuum sealer for your home. Reducing the amount of food you waste on a daily basis should always be a top priority for any household. Having a device that makes this process that much easier is worth every cent. A vacuum sealer will cut waste dramatically because the food you don’t finish will stay edible for a lot longer in the fridge. Too often do we find ourselves throwing away leftovers that we just didn’t have the time to get back too. Since you’re wasting less, you’re also buying less. You’ll be cutting out the need to replace food that spoiled before you managed to consume it. A vacuum sealer is a money saving device in any household and even office space. For some people, having an organized fridge or pantry is of utmost importance. This level of organization filters through to the energy of the home and makes for a more efficient living environment. You’ll no longer need to get creative with bulky store packaging and plastic wrappers that don’t fit together nicely. A vacuum sealer guarantees that food is always as compact and orderly as possible. It can then be stacked or packed however you prefer in the fridge or cupboard. This was mentioned as both a reason to invest and a notable benefit because it really is such a worthwhile feature of these devices. A vacuum sealer gives you the opportunity to also save foods that can’t be repacked into new plastic bags. Within the original bag, the product can simply be heated and later resealed so it returns to the state in which it was purchased. Of course it won’t work for all packaging but commercially packed items, food or not, can be resealed as long as the original packaging was of a plastic or foil origin. 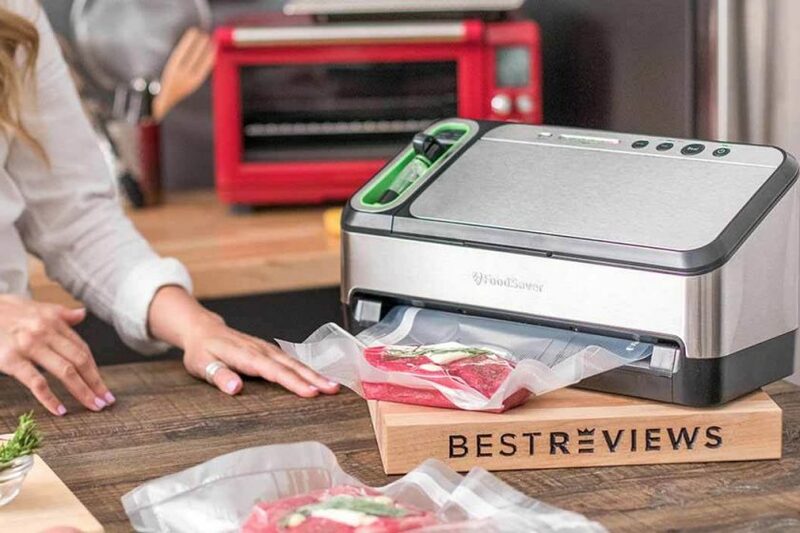 Vacuum sealers are the appliance you didn’t know you needed, and won’t be able to live without once you have. The waste reduction, cost saving and efficient means of packing that they bring is invaluable & a worthwhile investment for any serious homemaker. Why keep to what you’re doing if there’s a better way?